Product prices and availability are accurate as of 2019-04-20 14:46:30 UTC and are subject to change. Any price and availability information displayed on http://www.amazon.com/ at the time of purchase will apply to the purchase of this product. Perfect for couples and families who love camping, the HiHiker Double Sleeping Bag and Bonus Camping Light will make you enjoy the outdoors even more. You don't have to sacrifice a good night's sleep just because you’re outside. 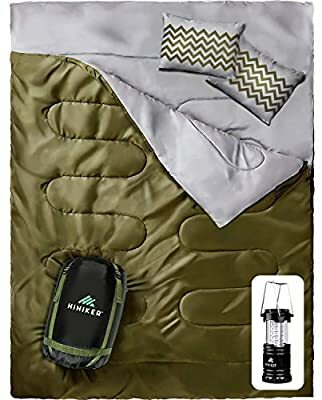 Unlike traditional sleeping bags that are too small, not warm enough and are constructed with a rough interior fabric, HiHiker furnishes you with the soft, warm comfort of a blanket combined with the strength of a high-end double sleeping bag. 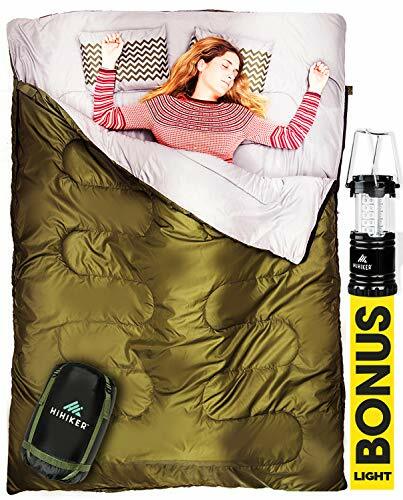 Durable yet lightweight, this sleeping bag is designed with a tough, waterproof outer shell and a soft interior lining that has a 210 thread count for a comfortable feel. This soft tetron and cotton interior delivers the cozy feeling of a blanket so you can enjoy a great night’s sleep even in colder temperatures – it's rated to 32° F, making it ideal for cool nights when temperatures start to drop. This extra-large, 87" by 59" bedding easily fits two adults or is great for snuggling with kids before bedtime. Cozy up to a loved one as you enjoy the beauty of nature or quickly convert it into two sleeping bags for individual use. This versatile gear comes complete with two travel pillows designed with a chevron pattern in matching colors and a nylon carrying bag for compact storage. For added convenience, the HiHiker comes with a bonus camping light to illuminate your way in the total darkness. The ultra-bright lantern boasts 30 individual, low-powered LED bulbs, and carries 360° of luminous light while saving energy. It collapses to a compact size that's easy to store and has a lightweight build so you can take the lantern on the go with ease. DURABLE OUTER SHELL. Made using camping-grade, waterproof polyester fabric, the outer shell of this sleeping bag will keep you dry from the outside elements. Each square inch of fabric packs a 210 thread count, designed to last a lifetime in the most severe conditions. Unlike similar products, this sleeping bag comes complete with two, stylish matching pillows for added comfort and convenience. SILKY INNER LINING. Sleep comfortably and stay warm anywhere you go. The inner lining is made using a textile combination of tetron and cotton, providing you with the super warm, cozy feeling of a blanket. LARGE SIZE. Measuring 87" X 59" in size, this sleeping bag comfortably sleeps two adults or can be separated into two separate bags for individual use. This allows you to cozy up with your significant other or child when you're camping out or you can each have your own separate space. RATED TO 32° F. Sleep comfortably even in cold climate conditions without shivering because of heat loss. Rated for temperatures of 32° and up, this sleeping bag is perfect for hiking, camping, traveling and more! And it's backed by a lifetime guarantee if not completely satisfied! CAMPING LIGHT. Durably built and extremely lightweight, you can take the including camping light with you wherever you go. It furnishes long-lasting, 360° of luminous light for up to 12 hours and can be collapsed when not in use to take up minimal space.